Posted at 2:47 pm on September 24, 2012 by Lori Z. Watch this video of the last Dinner with Barack, then make a donation to be automatically entered to be at the next one. Once the deadline’s passed, you may not have this chance again, so enter today—we’ll cover your airfare and hotel. Big spender! He’s really pushing this last supper thing. Will he whine again about not being the most interesting person in the room? President Obama’s Twitter feed tweeted it out the other day, too. With what we assume is supposed to be an invitation. Only it looked like something scrawled on Jim Messina’s or David Axelrod’s hand for the creepy #ForAll campaign. Hi @BarackObama I wonder do your union friends get paid for #DinnerWithBarack ? #DinnerWithBarack How much is that doggy in the window? “@BarackObama: have #DinnerWithBarack enter to win two seats at the last one of this campaign<seriously? Celebrity or president? #DinnerWithBarack Includes blaming Bush, Michelle not sure if she's proud of America yet, and a 6 iron. #DinnerWithBarack I wonder if he separates his food like he separates his countrymen? Anyone have Netanyahu's email? 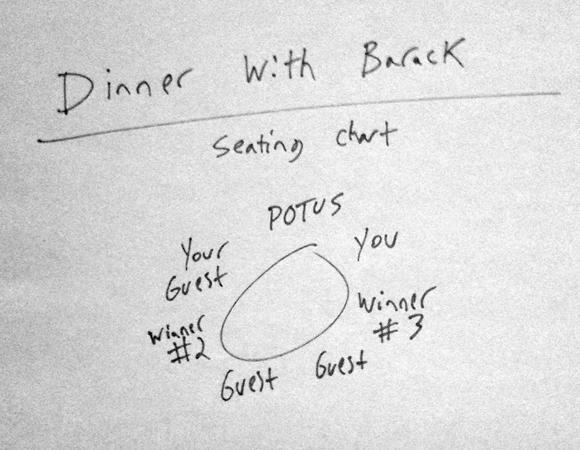 May be only way.MT“@BarackObama: See what it’s like to have #DinnerWithBarack—then enter to win two seats.."
Keep the invite turn-downs coming, Twitter! Giggling is our cardio.